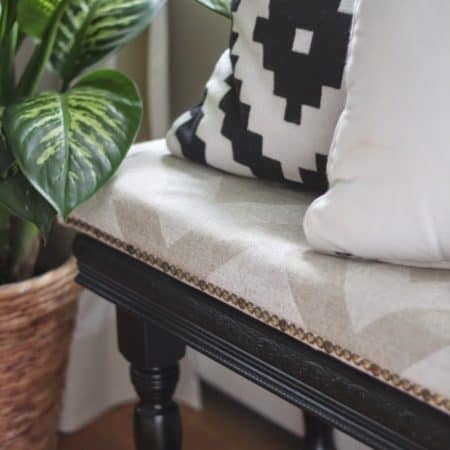 You know those little projects around the house that aren’t emergencies – tedious to-dos that need your attention eventually, but you just never seem to get to? Basically my entire house is made up of them. If you have some of those projects too, let’s bang them out together! Since the day we bought this house I intended to change out our front door doorbell and just never got around to it. After having the house painted the sad old doorbell stood out like a sore thumb, and now that I replaced it I can’t believe I waited so long! This little jewel sure is pretty isn’t it?! If you have this same doorbell and you’ve never even noticed it, then it’s FINE and don’t think twice about it! BUT seriously, ours was pretty gross and dingy and it had to go. The new doorbell is cast iron and in person, looks about 10 million times better than the old one!! I actually bought this one for the back door but I loved the brass button so I put it on the front door instead. Such a simple little upgrade! I have to patch that little hole above it again, but the iron one is a heck of a lot better isn’t it? The doorbell I put on our back deck lights up, which is nice if the deck light isn’t on. I think the screws are supposed to go on the sides but it’s still a big improvement. 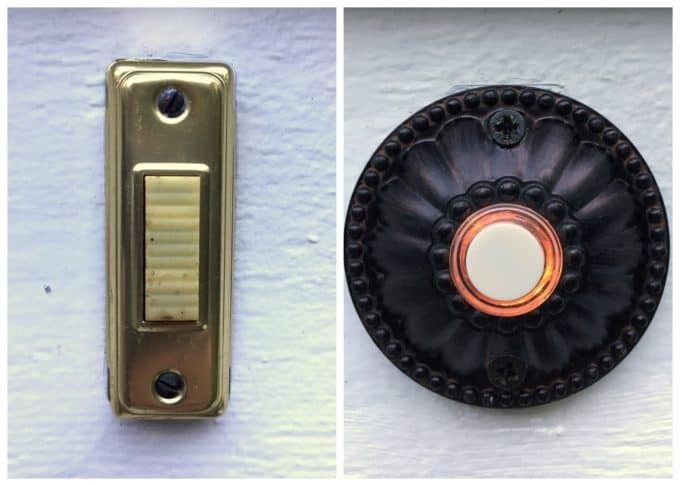 Even with turning the power off and then on, and touching up the house with white paint, this all took about 10-15 minutes total to change out the two doorbells. 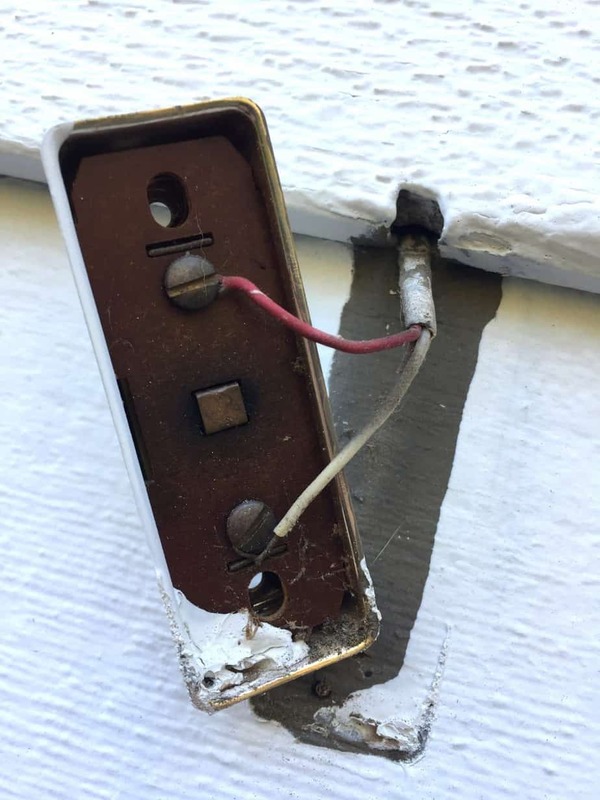 To replace a wired doorbell, all you have to do is shut the power off (I like to shut off the power to the whole house just be safe…..it’s not necessary but I’m a safety girl). Unscrew the old one from the house and turn it over, then loosen the screws to remove the wires from the old doorbell. 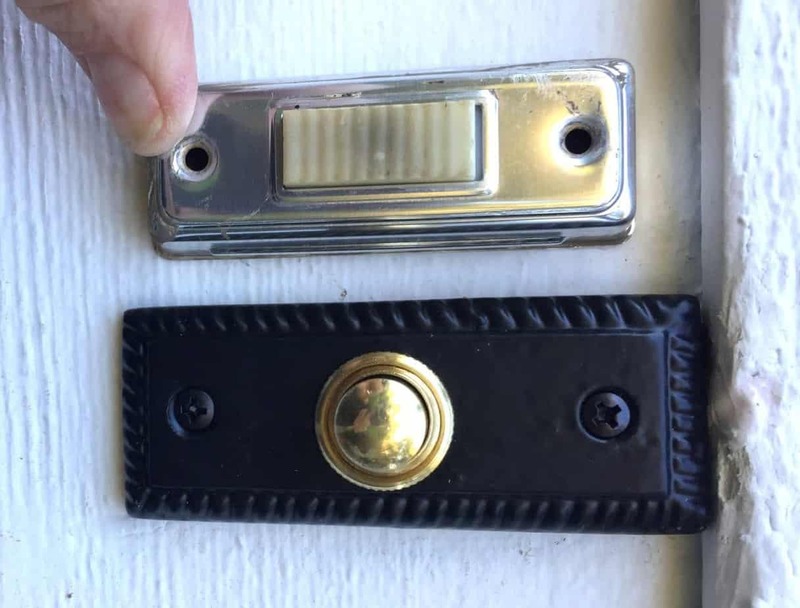 Attach the wires to the new doorbell in the same fashion and tighten the screws. Screw the doorbell onto the house, turn the power on, and ding dong ding dong a few times whilst patting yourself on the back. 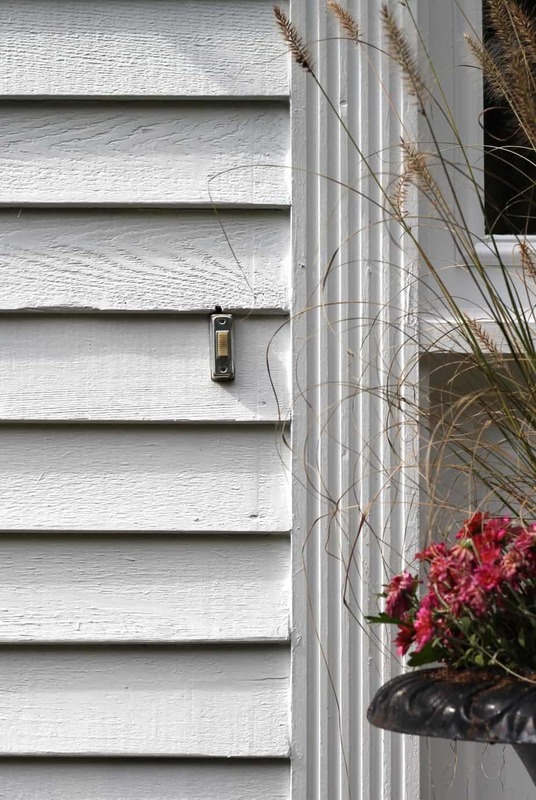 By the way there are so many pretty, and not crazy expensive, doorbells out there. Who knew? Here are a few you may like……I’m kind of loving this intricate brass one and wish I bought it! Tomorrow I’m thrilled to join a bunch of friends for a 4-week series on preparing for the holidays, room by room. Stop by for a visit! oooh i love those!!! would you know we don’t even have a doorbell… crazy i guess, but we don’t really need it. our driveway is a big hill so we generally know when people are coming up! 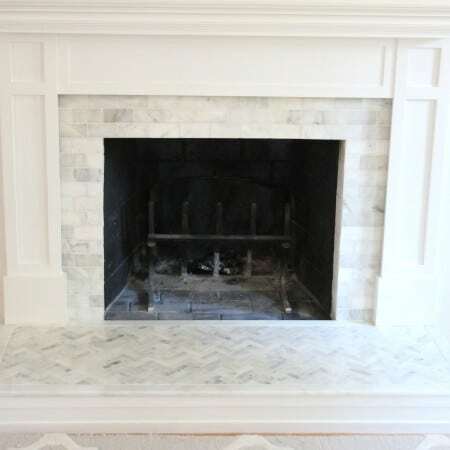 I agree, it is the small details that matter, hmmmm, makes me wanna share this small, unlikely detail in my home I changed recently on the blog too! I honestly never knew doorbells could be so lovely! Wonderful choice. This house doesn’t have one nor does our next (almost renovated!) house. Both are small enough that we won’t need one. Your post did make me think in panic of the 100 item list of things that need to be done but are not necessary to get us moved into the house. One thing at a time though… and first things first. 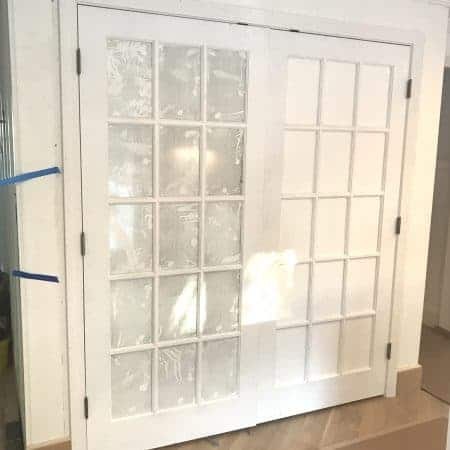 How exciting that you’re almost done renovating! I’m sure all those small things will get done…..eventually!! Best wishes! Hm, I totally agree. Take care every small thing will make our house more perfect. Have a great week ahead!